Published on March 3, 2016 in Crime in T&T, General T&T, Police and Violence. 1 Comment Tags: Crime in T&T, Nalinee Seelal, Newsday. ACTING Commissioner of Police (CoP) Stephen Williams has called on divisional heads to deal with the rising incidence of murders which up to press time yesterday, stood at 86 so far for the year. The top cop’s call to his divisional commanders came after he and executive members of the Trinidad and Tobago Police Service (TTPS) held a meeting on Tuesday with Minister of National Security Edmund Dillon at Police Administration Building in Portof- Spain. 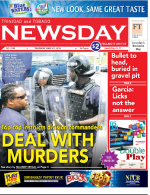 Newsday was told by senior police sources that Commissioner Williams yesterday mandated all divisional commanders, Police Secton heads and task force units to put together a ‘priority offenders list’ and target persons, who according to intel, have been engaging in continuous criminal activities. Division heads were also instructed to find ways and means of reducing the amount of murders, shootings and woundings committed in their respective divisions. The meeting of all divisional heads, head of sections and units was called by Commissioner Williams, following last week’s launch of the 2016 anti-crime initiative. Newsday understands all Divisions will use the priority offenders list to target persons who are known repeat offenders, persons suspected of being involved in criminal activities, persons already before the courts and persons on outstanding warrants. Newsday understands that apart from the priority offenders list, officers have been asked to seek and flush out others who may not be on the list, but who have been identified as persons intent on breaking the law. At the meeting yesterday, divisional commanders using Computer Statistical Reporting, were able to review their progress in crime fighting as well as measure their detection rate in order to implement measures for improvement. The officers were also addressed yesterday by other executive members of the Police Service. A source told Newsday that Acting Commissioner Williams is very concerned about the spate of murders and is also concerned over the amount of crimes in which guns are used. He has asked that all heads set a specific target in terms of removing illegal firearms and ammunition from their divisions. This he believes, will go a long way in reducing serious crimes especially murder. To deal with murderers Laventille and Beetham has to be bulldozed and high end commercial and residential buildings replace it. It could come under the city rejuvenation or revitalization project. Now it may seem silly or ludicrous to even contemplate such but many cities have undergone revitalization. One such city is Toronto a place where many Trinis live. A Trini by the name of Gordon Chung spear headed the effort to revitalize East Toronto. Similar to Laventille and Beetham there was a gun and drug culture. Today buildings that were poorly designed felt the blow of developers and entire neighbourhoods turned to dust. Replacing these structures are brand new mordern buildings with a community touch. Laventille and Beetham are high end real estate going to waste and could become the jewels of TnT. Left the way they are now they will continue to produce criminals “en masse”. There is a direct correlation between where someone lives and crime. Live in “depressed communities” without upward mobility and crime becomes the epicenter of your existence. You are born in the middle of the valley of iniquity and thus your short existence is perfectly sealed. Now this is not to say that there are only bad people in these areas, absolutely not, it is simply saying hope cannot be attain without proper planning and action. In China they have built cities over night, local contractors I am sure will be happy to be employed in projects that improve the image of the nation. I would say that the current administration should meet with Mr. Gordon Chung and get some ideas on the path forward. These areas could embrace a new dynamic and familial setting that would erase the pain of the past and set them in a new trajectory. It is possible but it will take the will of the present administration to point the way forward. A combination of commercial and government buildings will enhance that neighborhood.